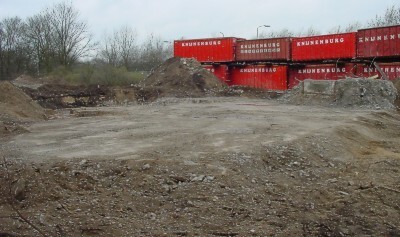 A Pak casemate type 625B, built on the Kleine Alexanderkazerne, a former Dutch army-barrack in Den Haag, was demolished on Saturday 09-03-2002 at 08:45 hours. With a special permit it was possible for us to examine this special bunker during the proces. Some pictures may not be appropiate for the peace of mind of real bunkerlovers. In this case the public interest was bigger than the historical value, so nobody is to blame for this demolition. Some you loose, some you win. With special thanks to Arthur Beugelsdijk for the pictures and ir H.F. Ambachtsheer for his permission to show the bunkerplan.